After a not too pleasant experience of a course in Gibralter I was a little apprehensive about taking my Day Skipper again. I arrived with two good friends Dan, a dinghy sailor, and Roy, completely new to the sport. By the end of the week we were already planning our return to sail on Kinetic with Keith. 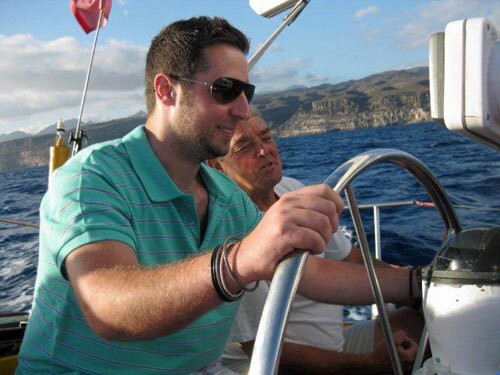 His teaching style is extremely relaxed and his sailing knowledge is second to none. I learned more in a week with Keith than I have in the last two years of sailing. My aim was to achieve Day Skipper only although I am now planning to complete the online coastal skipper thoery with Aistrac and returning next year for mile building. Roy and Dan will be doing Day Skipper theory with Aistrac also. Keith's style of teaching encouraged us to work safely as a team and although the prospect of chartering independently remains a little daunting we feel well placed to take the next step. The mooring location of Kinetic is absolutely perfect within touching distance of the beautiful restaurants of Puerto de Mogan Marina. For those new to sailing or moving up to Day Skipper you could not ask for more! Having attended a number of RYA theory and practical courses I would highly recommend Aistrac. We will most certainly be coming back for more of the same.